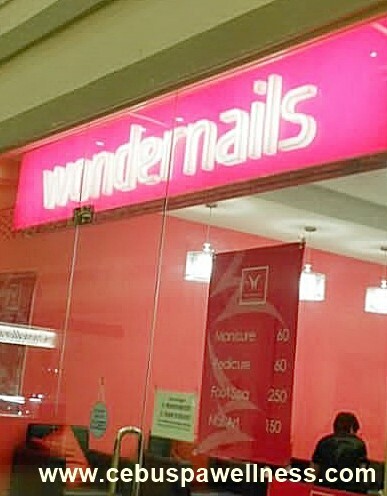 In case you happen to live somewhere in Mactan and you want to try out a chic and quiet salon for a mani-pedi and foot spa, there’s a WonderNails franchise in Gaisano Grand Cordova. From the outside you will be greeted with a pleasant pink and white modern minimalist interiors with uber-comfy single couch for each customer. I went there one evening because I want my nails to look stylish for the holidays. It’s almost Christmas and I can understand that people like me would want to look good in parties, weddings or other events. Then when the holidays are over, we can all go back to our emaciated and homeless selves again and no one would really care. Haha. Just kidding. Time for my foot spa. Seriously, my hands are perennially dry because I am what you call a ‘germaphobe’ (people who are obsessed with cleanliness and washes their hands excessively). I hate the term but I am that, sadly. 🙁 For me to see a dash of color and design on my nails would be an awesome consolation for me. From their menu, I chose their Manicure (P60), Foot scrub with Pedicure (P190), Nail Art (P150) which gives me a cool P400 price tag for everything which is affordable, really. Don’t mistake them as just a nail salon because they have a slew of other beauty services such as hair rebonding, eyebrow threading, leg waxing and even make up, just to name a few. So I settled myself in one of their nifty little sofa beside their glass door entrance and started flipping aimlessly on the magazine that they handed out while my pedicurist started priming my feet with lukewarm water and cleaning it. Mmmm, feels good. Now, I may be one of those folks who absolutely love to stay in spas out of useful vanity or just sheer boredom, but really I would be the first one to tell you that you can actually do your own foot spa at home and save your moolah for something else. It’s pretty easy even kids can do it. But of course, it doesn’t hurt to visit a salon sometimes and let someone do it for you. In effect, you save yourself the hassle, you get to relax and you are contributing to the economic landscape of this financially-distressed country. A few minutes later, my manicurist was on my side to work on my hands. Now, there’s two people multitasking on me. Both were obviously connoisseurs in this field and I’m impressed that I didn’t succumbed myself to pain unlike what I’ve experienced in other nail salons or home service. 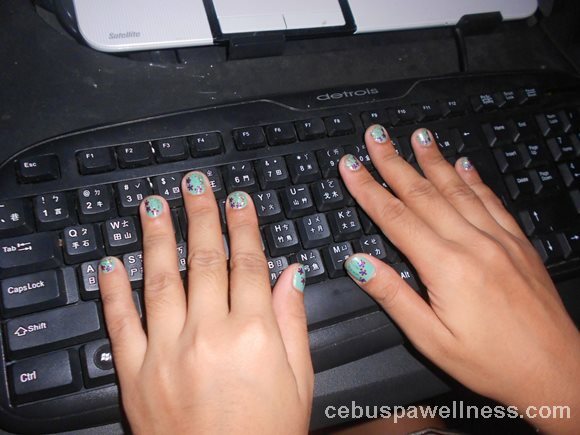 What particularly piqued my interest was when when my manicurist started applying the needle-thin nail art pens and worked on those red-purple trio flower design with gold stardust and mint green background. I’m a big fan of nail art polish. I should probably buy myself one of these tools online and practice myself with it. Maybe I could make a lucrative career out of this, who knows. I almost feel sleepy and a little bored by the time it was over. My nails are looking all spiffy now and my feet felt great sans the dull skin caused by the dead skin cells. Now, I’m ready to show them off again. Thanks, Wondernails! They have friendly staff and the ambience is immaculately elegant. Their services compensate well for the price you pay. In fact, they are one of the most affordable there is in the mid-range market and their prime location which is mostly inside malls or shopping centers will make you want to visit them whenever it’s convenient. Perhaps on my next visit to WonderNails, I should try their hair services. I was told their hairdresser was on leave, so yeah, next time it is.